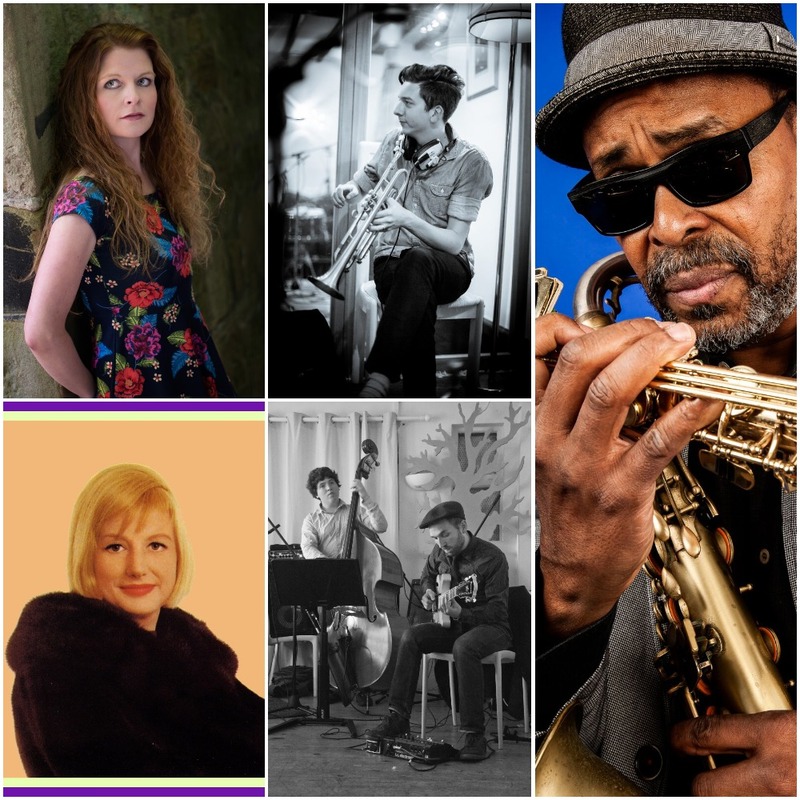 JazzLeeds Spring programme is a complete festival by itself! We have more than 30 concerts jazz with something for all tastes. There are concerts by international jazz singers including Anita Wardell and Deelee Dubé plus our own Emily Brown from Leeds. 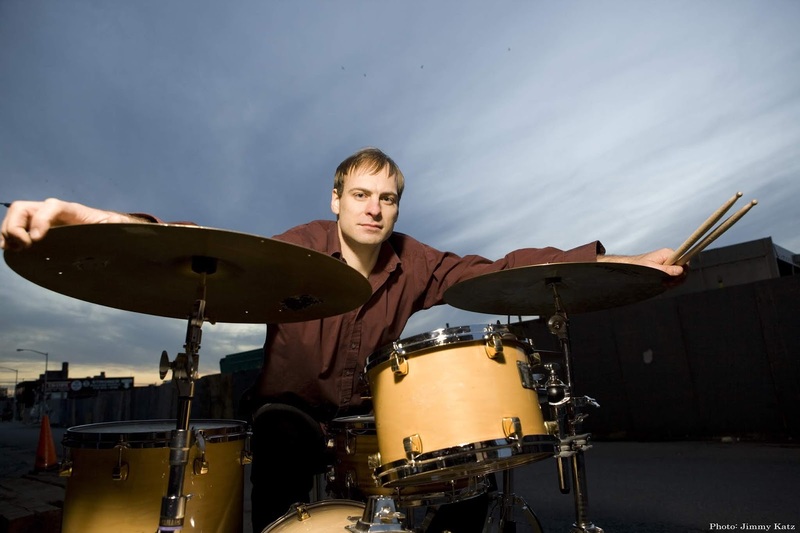 We have American jazz stars including drummer Ari Hoenig and saxman Harry Allen. There are three groups led by young women jazz musicians – Emma Johnson’s "Gravy Boat" with Nishla Smith, Jasmine Whalley’s "Jasmine" and Kim Macari’s "Family Band". There are big bands too including the London-based Tom Green's Patchwork Jazz Orchestra, and our own Leeds University Union Big Band. South African township jazz is included with Adam Glasser’s “South Africa & beyond”. 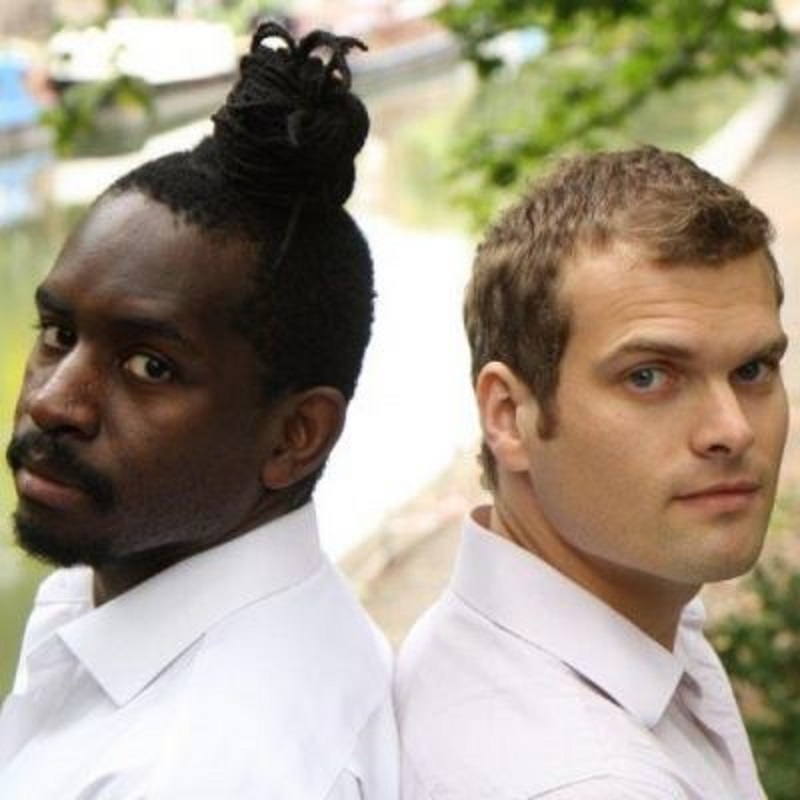 There is a beautiful jazz duo too of pianist Andrew McCormack and saxman Jason Yarde. We have two special features - “The Jazz of Dudley Moore” and Tony Kofi’s “Portrait of Cannonball Adderley”. Leeds legends also get a chance to strut their stuff too with saxman Tony Burkill reforming his band "Work Money Death" plus Atholl Ransome and Malcolm Strachan's "Soul Cooker" making a welcome appearance. Traditional jazz also features strongly with Ros Lewis’s “Tailgaters”, gypsy jazz band “Rose Room” from Scotland and Stefan Grappelli’s guitarist John Etheridge with "Sweet Chorus" – his 70th birthday special! 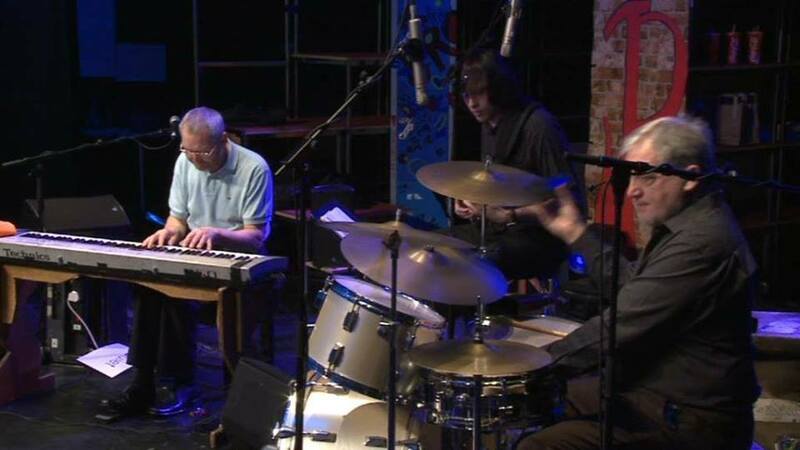 Robin Aspland piano, Jeremy Brown double bass and Steve Brown drums. 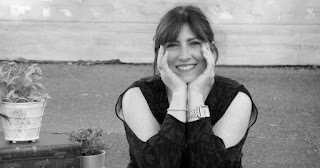 Anita Wardell’s singing is exciting and breath-taking. She is noted for her mesmerizing and captivating vocal improvisations and vocalese lyrics to instrumental solos. 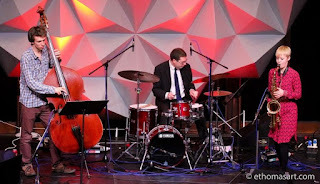 Ari Hoenig drums with Tom Ollendorff guitar, Conor Chaplin bass. Busy top-notch NYC drummer makes a rare visit to Leeds with guitarist Tom Ollendorff and bassist Conor Chaplin. They deliver sharp, streetwise modern jazz that borrows as much from drum 'n' bass as much as it does from pristine ECM and dirty downtown aesthetics. 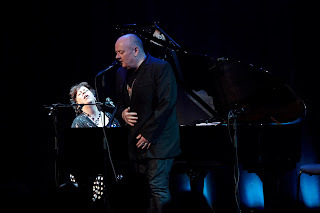 January sees the season begin at the Crucible on Friday 18th, with an unmissable opportunity to see two of the UK's most treasured jazz vocalists, when Liane Carroll and Ian Shaw play in a duo. Both are magnificent singer-pianists, each with musical class and incorrigible wit and personality. 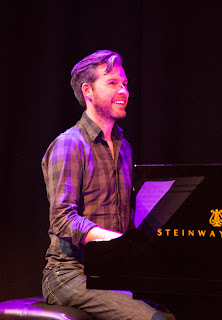 A week later John Law's Re-Creations kicks off the season at Crookes, with his latest project featuring well-known tunes from the worlds of classic jazz and pop. February begins with the visit of Byron Wallen's Four Corners quartet. Having played alongside such legendary musicians as Andrew Hill, George Benson and Jack de Johnette he brings to Sheffield his dazzling band featuring guitarist Rob Luft, who made such a great impression here last winter. Hard on his heels is the Duncan Eagles quartet, building on a string of highly praised releases with top band Partikel by touring the UK to promote his new album "Citizen". 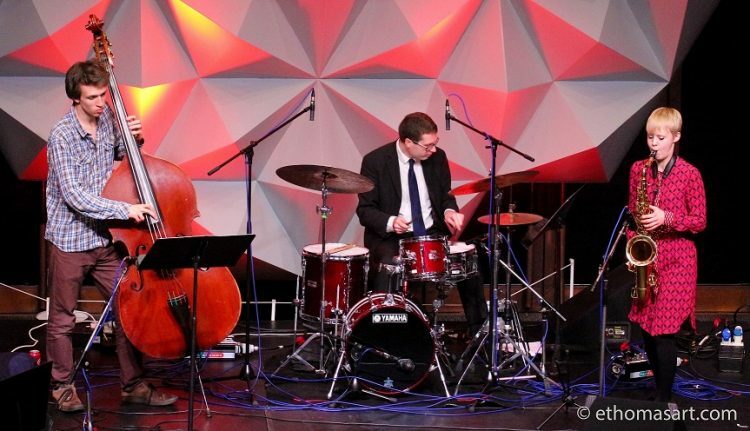 On the 15th February we have the visit of the brilliant quartet Two of a Mind, where Chris Biscoe and Alison Neale explore the wonderfully melodic music of Gerry Mulligan and Paul Desmond, as well as their own material. The month ends when we host one of the most gifted and imaginative composers in Europe: Gwilym Simcock plays solo piano at The University of Sheffield on the 28th. The first gig in March sees the Sheffield University Jazz Orchestra play an evening of varied big band jazz at Crookes, They're followed by John Turville, who brings his all-star quintet featuring Julian Arguelles and Robbie Robson playing a wide-ranging set of new music including arrangements from the jazz, tango and Latin worlds. 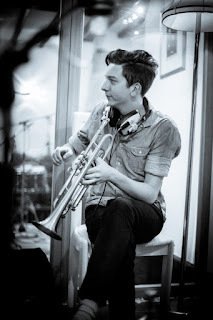 Next band up is the Adam Glasser quintet, where the South African harmonica player / pianist brings a great band of leading young British musicians to play his trademark township standards. Another fine band follows, with the visit of Henry Lowther's Still Waters quintet. 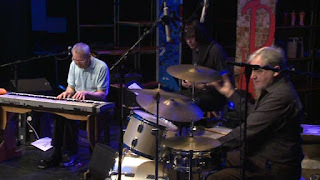 One of the most accomplished, tight and creative bands around, they play radical and original music, and include pianist Barry Green, whose own trio played such a great set at the Crucible in 2017. Finally, the month ends when Tony Kofi brings his sextet to play A Portrait of Cannonball, which traces the explosinve music of jazz giant Cannonball Adderley. 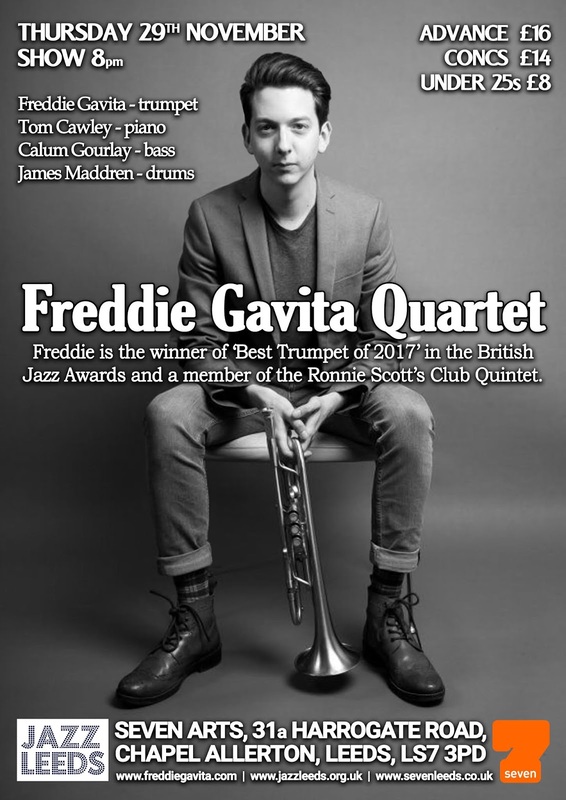 April's first gig in the last round of the season returns to the Crucible, when the internationally-acclaimed Tommy Smith and his outstanding quartet pays tribute to his greatest inspiration, John Coltrane. 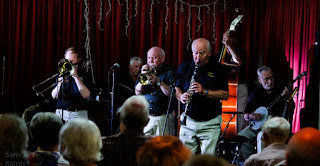 Back at Crookes the following week, the Harry Allen quartet appears. One of the key American mainstream voices on tenor sax, we've nabbed him on a rare visit to the UK and with the bonus of the fine Italian pianist Andrea Pozza. The whole Sheffield Jazz programme ends with a rousing gig on May 10th; Tony Kofi returns with the Mingus Profiles Sextet who were so good at the Crucible in Autumn 2015. Uplifting, exuberant, rousing music. Two nights with the Strictly Smokin' Big Band at Gosforth Civic Theatre in Newcastle (Fri 14 & Sat 15) are officially sold out. If you haven't got a ticket you could try pestering the box office (0191 284 3700) for returns. 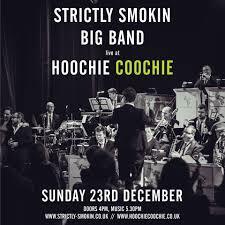 Fortunately the SSBB will be doing it all again on Sunday 23 at Hoochie Coochie. It's a 5:30 start, tickets are selling fast, so, don't delay, get on to the band's website or the venue's website to secure your tickets! A Jazzy Christmas is Paul Edis' popular seasonal presentation. Last year's inaugural Sage Gateshead concert sold out and ticket sales for this year's renewal (Fri 21) suggest another sell out is on the cards. 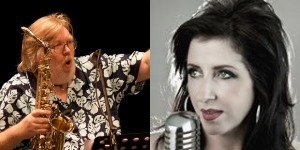 Vocalist Jo Harrop returns, as does Yorkshire-born, London-resident saxophonist Matt Anderson alongside Emma Fisk, Graham Hardy, Andy Champion, Russ Morgan and a sack-full of guests. If Thursday (20) suits you better Edis will be presenting the same show at Ushaw, Durham with John Garner on violin in place of the indisposed Fisk. Christmas Eve...what do you mean you're busy? Hand to Mouth - that's Lindsay Hannon and Bradley Johnston - will be playing tunes from 11:00am at Ernest on Boyd Street, Newcastle. It's free admission, treat yourself to a coffee and some (Christmas?) cake as you listen to Ella accompanied by Joe Pass...they're that good! Boxing Day...forget the 'I shop therefore I am' madness and head down to the coast. Metros and buses will be running, take a bracing walk along the seafront then, from noon, visit the magnificently restored Spanish City in Whitley Bay to catch the Vieux Carré Hot 4. 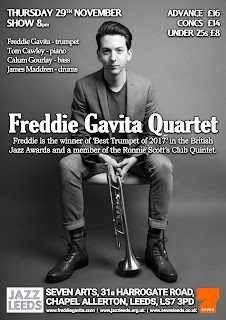 Sunday 30 at the Jazz Co-op's HQ on Railway Street reunites the Francis Tulip Quartet - guitarist Tulip (Birmingham Conservatoire), Ben Lawrence (Durham Uni), Michael Dunlop (Guildhall) and Matt MacKellar (Berklee) - for a seasonal post-bop tear-up. Simply unmissable. And finally, New Year's Eve isn't devoid of jazz, far from it. To mention but two gigs - the last night (that's the last night ever before relocating to Newcastle) at Gateshead's Prohibition Bar promises a varied bill of fayre (including burlesque!) 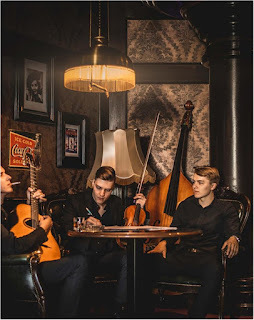 with the jazz interest supplied by Strictly Speakeasy, and, from late NYE into the early hours of 2019, the Tyneside Cinema's celebrations include music courtesy of the Bradley Johnston Trio. Since its launch in 2013, Jazz North’s northern line has supported 67 jazz artists and ensembles from across the north with over 700 gigs. This month, applications open for Round Seven of the scheme giving more artists the chance to develop their profession. 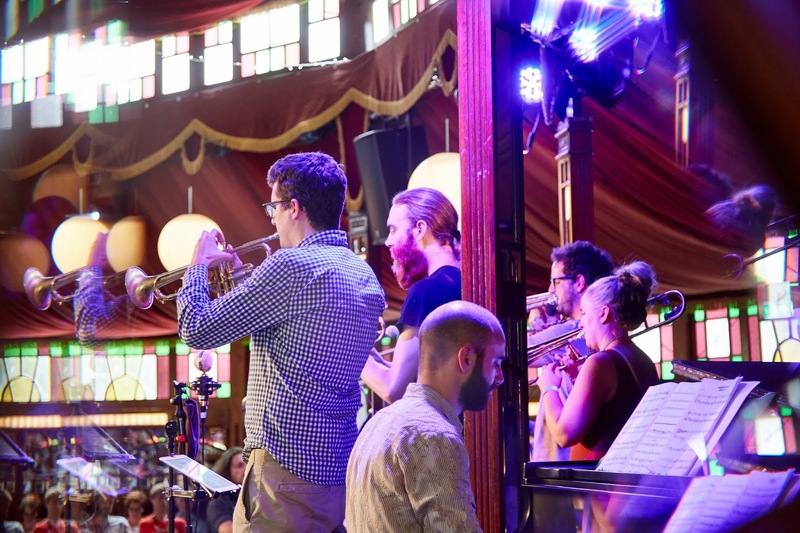 Jazz North’s northern line is the organisation’s flagship programme that supports jazz artists through subsidised touring, mentoring and industry support. Successful applicants can expect 12 subsidised gig performances at festivals and in venues, minimising financial risk through guaranteed payments and a minimum fee rate. An electronic press kit of the artists will be produced to send to promoters, following a photo shoot and marketing insight from Jazz North. There will be an opportunity to perform at Jazz North’s northern line showcase day at Lancaster Jazz Festival in September 2019 in front of national and international jazz promoters where a video show reel will be filmed for promotional purposes. One to one mentoring with Jazz North is also on offer to identify individual areas of support. Jazz North are looking for artists from across the north to apply. “We want to represent the diversity and quality of talent living and working in the North of England,” explains Jazz North’s northern line Project Manager Lucy Woolley. “We believe it is important that audiences and promoters have access to a wider cultural offer and we expect Jazz North’s northern line to present a varied roster of artists that is reflective of the northern jazz scene. Applications are now open and will stay open until the end of January, with successful applicants announced in April 2019. Continental Swing to finish off 2018! Come along to our yearly celebration of the best of Wigan jazz, which for those of you who are still unaware means our wonderful, home grown, youth jazz orchestras. These are the youngest band, the intermediate, and the oldest and most experienced. If you have never seen the youth bands of Wigan you will be astonished by the quality of the music. The event will be well-attended by parents and families of the performers, as well as fans of the bands and the usual jazz club supporters. This all adds to the party atmosphere, so come along and have a great time. Wigan Jazz Club, Friday, 28th December 2018. At the newly refurbished Whelley Ex-Servicemens’ Club, 108 Vauxhall Road, Wigan WN1 3LU. 12.30pm till 3.00 ish. £11 members, £11.50 concessions, £12.00 non members. We've got everything from the energetic grooves of Vipertime at the Lescar helping us into the festive season, classic vocals and the music of Thelonious Monk from Aaron Casserly Stewart, and guitarist Jiannis Pavlidis tearing things up with a classic guitar/organ/drums line-up. Asaf Sirkis and Sylwia Bialas present something utterly beautiful and unique in December, Johnny Hunter's quartet return with further explorations of the outer reaches in January, and we have two acclaimed sax players; Helena Kay with her trio, and Jon Shenoy, in duet with guitarist Sam Dunn. A return for a phenomenal Swedish-born guitarist Jiannis Pavlidis, with a brilliant trio which features Martin Longhawn on organ, and Luke Flowers (Cinematic Orchestra) on drums. With Ben Powling (Mansion of Snakes, World Service Project) - Saxophone, Matías Reed - Bass, Charlie Grimwood - Drums, Patrick Morgan - Drums. Vipertime featured recently on Gilles Peterson’s recent BBC Radio 6 UK jazz special, and look set to make a big impression in 2019. 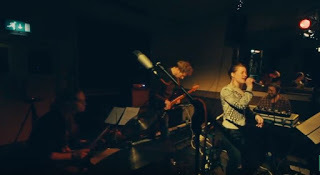 A really special start to 2019 with a tenor sax player that we’ve been looking forward to presenting for some time, a musician with an incredible sound and brimming with energy and rich melodic ideas, Helena Kay (winner Young Scottish Jazz Musician of the Year 2015, Peter Whittingham Award 2017), is joined by a great trio featuring Fergus Ireland (double bass) and David Ingamells (drums). A welcome return for an energetic and creative drummer with his delightfully explorative and always so musical quartet, featuring Graham South (Beats & Pieces) on trumpet, Mark Hanslip (Outhouse, Nostalgia 77, Steve Lacy, Kenny Wheeler, Bob Brookmeyer) on tenor sax, Seth Bennett (Sloth Racket, Metamorphic) on double bass. We bring together an intimate and swinging duet of two of the best players on their respective instruments in the UK; tenor sax and clarinet player Jon Shenoy, is joined by guitarist Sam Dunn, until recently based in Sheffield, and making a very welcome return. Jez Matthews and The Jazz at The Lescar team. Eirik Svela is establishing himself as an important voice amongst a new generation of jazz musicians in Scandinavia. In March 2018 he recorded his debut album "Bitds and Pieces" in New York with the internationally acclaimed organ player Sam Yahel (Joshua Redman, Norah Jones) and in November he will be touring in England with his band Eirik Svela Group. The UK edition features some great musicians including Jamil Sheriff (piano), and Andrew Robb (bass). They are also bringing Magnus Eide, an up and coming Norwegian drummer with a fast-growing reputation. 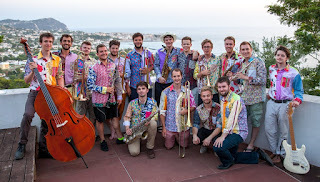 The Eirik Svela Group has grown out of the environment around the Norwegian Academy of Music. The group performs mainly music written by band leader Eirik Svela, which focuses on combining pretty melodies and complicated chords in an effortless way. This coming Saturday, 24th November we will be host to the Frank Flynn CDF# trio: Chris Hodder, guitar and bass guitar; Dave Minshull, drums & percussion, and Frank Flynn on keyboard, and who leads this band, although he claims not to. Any way the music will be just great; I wouldn`t want you to miss it. Influences for the group come from such artists as Weather Report, Stevie Wonder, The Beach Boys, Billy Joel, David Bowie, The Yellow Jackets, Michel Camilo, Hiromi, Errol Garner, Oscar Peterson, Ravel, Mozart etc plus a generous helping of quirkiness. Usual venue: Hornby Village Instutute, Main Street, (A683) Hornby, LA2 8JR. Doors & bar open at &.30, music from 8 p.m Tickets £10, on the door or ring 015242 21675. Jazz North’s northern line showcase is moving on to its next destination, Lancaster Jazz Festival. 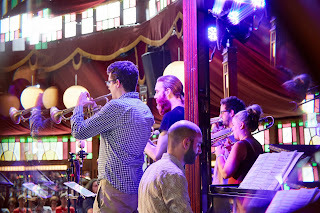 Running from 11th to 15th September 2019, the Festival will be hosting the showcase on Friday 13th September, which will see all the bands on Jazz North’s northern line Round Seven roster perform. Jazz North’s northern line showcase has enjoyed five years at manchester jazz festival. 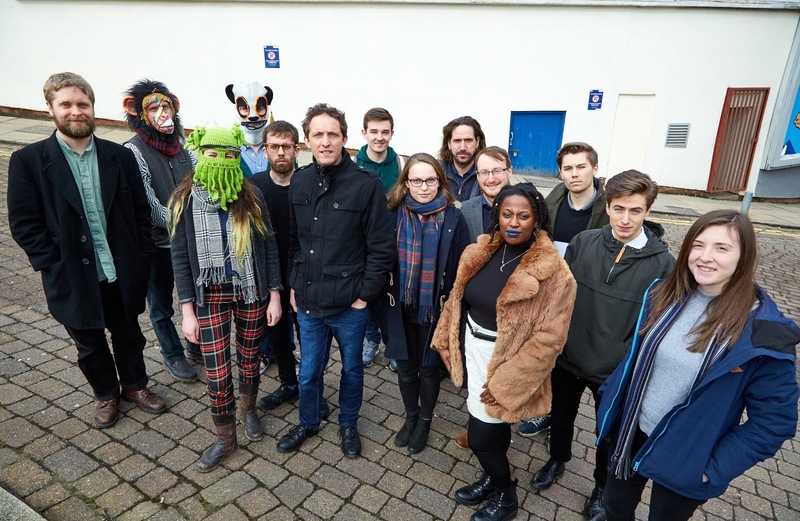 “I'm delighted to be handing over the showcase footplate to Matt and the team at Lancaster Jazz Festival,” says Steve Mead, Artistic Director of mjf. “Showcase day is always a fun, surprising and rewarding marathon bringing together distinctive artists, enthusiastic audiences and committed presenters. The Estonian Embassy in London are promoting three concerts by virtuoso Estonian gypsy-jazz trio Titoks, including one date Thus 7 November in Leeds. The trio (Kristjan Rudanovski on violin, Jaanis Kill on guitar and Robert Nõmmann on the double bass) will be presenting music from their newly released album “When Day Is Done”. Holiday’s performance was part of the socialite and philanthropist Louise Crane’s “Coffee Concerts” series. Featuring Jazz luminaries including pianist Mary Lou Williams, singer Maxine Sullivan - and of course Holiday herself- the concerts saw live performances against a backdrop of visual art, in a Gallery housing some of the greats of 20th century art.. The “Concerts” drew New York’s celeberati, including figures such as the celebrated poets Elizabeth Bishop (Louise Crane’s partner) and (Crane’s close friend) Marianne Moore. In homage to Holiday’s MoMA performance, Rommi Smith, poet, playwright and performer, leads a spoken-word performance tour of Leeds Art Gallery. This performance features the premiere of Smith’s brand-new poem in celebration of Holiday’s performance, researched and written during a recent stay in New York. In collaboration with bassist Ken Higgins, pianist Dave Evans and with theatre-director, Jason Hird, Smith invites us to consider the intersection of works of art: leading the audience through the different spaces of the Leeds galleries, halting at various paintings and sculptures to explore how spoken word and music might animate seeing a Gallery’s visual art in new and exciting ways. The evening begins with a gathering of audience and performers in the Gallery’s Lecture Theatre and ends there with a follow-up discussion session. Sat 17th November – Swing Commanders – one of the highlight evenings of the year. A stunning, vibrant and highly versatile group which performs an exciting mix of 40s/50s classics, swing, jump jive and so much more. Multi- instrumentalists par excellence coupled with truly energetic showmanship. Always an evening to remember. Sat 1st December – Hot Fingers with Emily Campbell – one of our most requested groups led by the UK’s finest exponent of the guitar and banjo – “Spats Langham”. On this occasion, the music is described as the “red hot jazz” of 1920’s New York. Without question, it’s a truly class act – the more so with the delightful Emily – a classically trained and superb vocalist who claims to draw her inspiration from Ella and Peggy Lee. But this only scratches the surface of the wonderful sounds which emanate from this talented group. Not to be missed! Sat 15th December – Christmas Party Night with the Harlem Hot Stompers – and would you believe it – it’s Christmas Party Time again! The ‘official’ start to the Christmas Festivities with its traditional festive atmosphere, nibbles, mince pies and the special Christmas raffle. And the whole fun filled celebration driven along at a cracking pace by the Harlems with their special guests - Bill Smith on cornet and Mike Pembroke on trombone. A fitting end to a wonderful year of wonderful sounds! Thanks for your support – it’s what keeps music live. Spread the word – JITS is live, fun and friendly – no better way to spend Saturday evening. The Edge Hill University Big Band, directed by Phil Shotton. 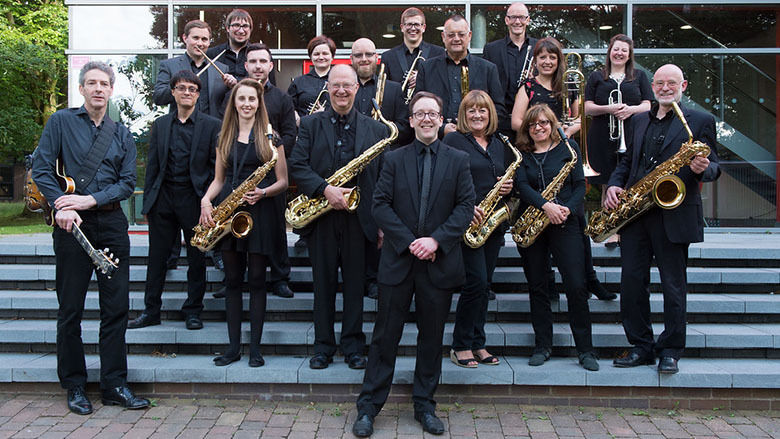 The Edge Hill University Big Band comprises of students, staff and members of the local community. 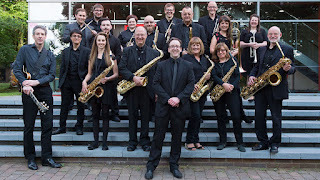 ‘Following on from their highly successful show ‘The Art of the Modern Big Band’ Edge Hill’s very own big band bring their eclectic mix of contemporary big band music back for another music extravaganza. Wigan Jazz Club, Sunday 25th November, 2018. And why wouldn't you start with a Jam! We pride ourselves at JazzLeeds at having the friendliest jam session in Leeds. No elbows out, or cutting contests, we welcome all people of all standards who just want to come along and play. Jennie Hammond vocals, Jason Scott piano, Will Powell guitar Steve Crocker bass and Dom Moore drums. Jennie Hammond interprets the songs of Blossom Dearie, a remarkable vocalist jazz pianist, and composer from the bebop era who was able to bridge the gap between west side rhythm and east side lyrical content throughout her career. Tickets £18 full price £16 concessions £9 (half price) for NUS and under 25’s. The return to Leeds of a very special band led by a former Jazz Messenger. 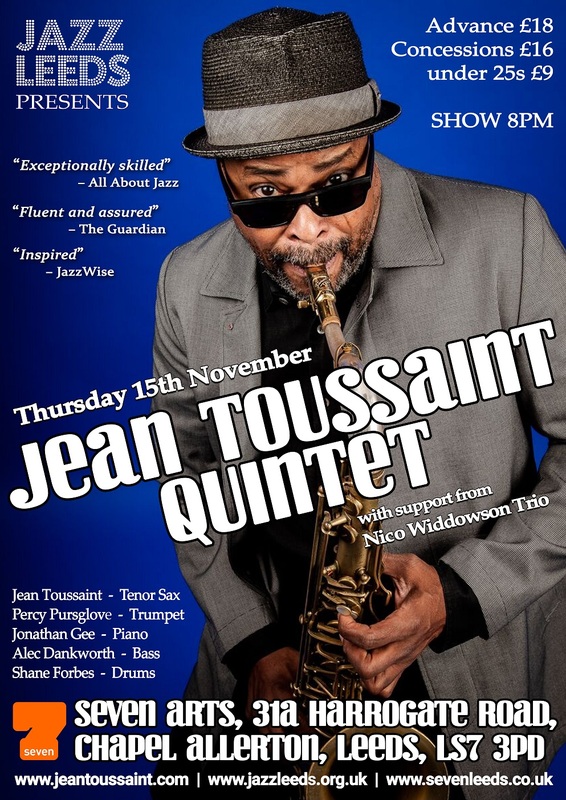 Grammy-winning saxophonist Jean Toussaint who first came to prominence when he joined Art Blakey’s Jazz Messengers in 1982. Since moving to London in 1987, Toussaint has released ten critically-acclaimed CDs as a leader. Tonight he presents his 11th album, Brother Raymond, as part of a UK tour with a truly all-star quintet. The music of “Brother Raymond” builds on the legacy of Art Blakey but above all confirms Toussaint’s place as an accomplished composer at the forefront of modern jazz. Welcome return to Inkwell from this very talented singer and songwriter from Newcastle. Zoë Gilby has been making a real impression on the jazz scene today. A repertoire starting with her compelling original compositions written with double bassist husband Andy Champion and guitarist Mark Williams . 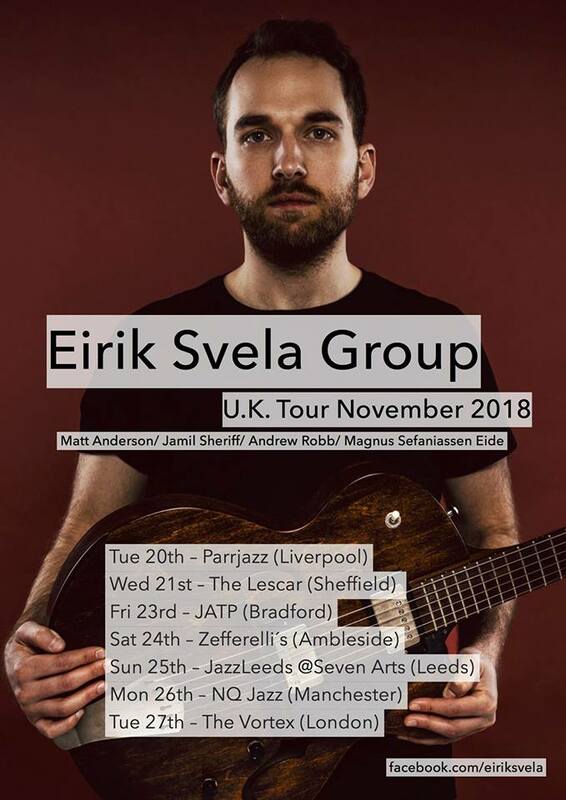 Norwegian jazz guitarist Eirik Svela is establishing himself as an important voice amongst a new generation of Scandinavian jazz musicians. In March 2018 he recorded his debut album in New York with the internationally acclaimed organ player Sam Yahel (Joshua Redman, Norah Jones) and in November he is touring in England with his group. Eirik Svela is an alumnus of Leeds College of Music, and appeared at Seven Arts many times whilst here as a student. His group has grown out of the environment around the Norwegian Academy of Music. Our Venues: Seven Arts 31 Harrogate Road, Chapel Allerton, Leeds LS7 3PD and Inkwell Arts: 31 Potternewton Lane, Chapel Allerton, Leeds LS7 3LW . Further information on all our events and links to our Facebook and Twitter pages available on www.jazzleeds.org.uk See you soon as one of our gigs! 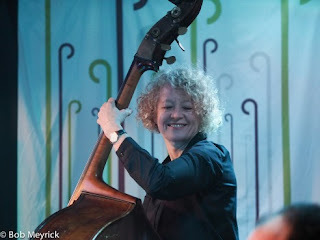 Huddersfield Jazz is proud to welcome singer, song-writer, teacher and all-round jazz impresario Nicki Allan. Nicki has performed all over the country, at venues varying from Glastonbury to local events up and down the country. Her jazz quartet features some of the finest jazz musicians in the North, and includes the legendary Huddersfield saxophonist Rod Mason. Following hot on the heels of last month’s hugely successful Middlesbrough Jazz Weekender comes Mike Durham’s Classic Jazz Party. Formerly the Whitley Bay Jazz Festival, the three day Jazz Party - Nov 2-4 - attracts ‘classic jazz’ era fans from across Britain, Europe and America to the Village Hotel on North Tyneside. Similarly, musicians fly in from all four corners of the globe making the weekend gathering the pre-eminent festival of its kind this side of the Atlantic. Americans include the trumpeters Duke Heitger and Andy Schumm, drummer Josh Duffee, together with first time visitor Dan Levinson, reeds. The European contingent’s number includes French trumpeter Malo Mazurie, Germany’s Matthias Seuffert, reeds, and Norwegian master pianist Morten Gunnar-Larsen. Britain’s virtuoso pianist Keith Nichols leads some of the host nation’s finest including the always entertaining Spats Langham, trumpeter Jamie Brownfield and, from Co Durham, violinist Emma Fisk. For ticket details email: wbjazzfest@btinternet.com. There is much else on offer during the month including a particularly strong jazz element at Sage Gateshead. Curtis Stigers returns with an all-star NYC quartet. Vocalist, and occasional saxophonist, Stigers will be playing numbers from his recently recorded Sinatra album (Mon 5). The following evening (Nov 6) there couldn’t be much more of a contrast with Soft Machine in Sage Two. Etheridge, Babbington and Marshall will be joined by Theo Travis as they revisit fifty years’ worth of material. London-based Kansas Smitty’s House Band makes its Sage Gateshead bow (Fri 9) and at the end of the month (Tues 27) trombonist Jason Holcomb premieres a commissioned work - Sacrification - as part of a triple bill dance evening with Eliot Smith Dance. 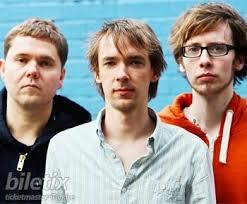 Newcastle’s Riverside venue isn’t known for its jazz gigs but on Wed 7 GoGo Penguin can be heard playing there. It will be interesting to see who turns out. Saxophonist Sue Ferris plays two gigs in eight days, first a trio date at Bishop Auckland Town Hall (Nov 16), then a quintet outing at Durham’s Gala Theatre (lunchtime Nov 23). Topping and tailing the month are two contrasting gigs. An interesting looking proposition is a first gig by the wonderfully named Charkie Parlour. 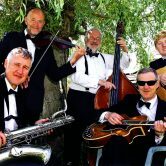 Violinist John Garner leads the contemporary quartet – guitarist Mark Williams, bassist John Pope and drummer Russ Morgan – at the Globe (Nov 1), meanwhile, closing out the month (Nov 30), violinist Emma Fisk takes her ever-popular Hot Club du Nord to St Cuthbert’s Centre in Crook, County Durham. Finally, a date for the diary - Sat 17th. Queen’s Hall, Hexham hosts the second, annual Forever the Beat of the Drum fundraising concert in memory of drummer Mark Jon Bolderson. 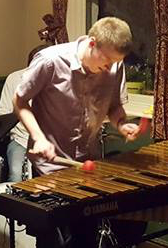 Following the death of the Tyne Valley Big Band’s former drummer, a percussion foundation was established and this concert forms a key element in ongoing fundraising activities. 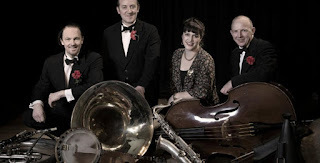 Coming to Newcastle's Globe this month ... two very new bands, Charkie Parlour and George Sykes Quartet, both featuring some the North East's finest jazz musicians; one very well-established trio led by veteran maestro Alan Glen; and the award-winning 'Best Ensemble of 2018', Alison Rayner Quintet. New jazz quartet featuring North East's finest improvisers Northeast-based quartet Charkie Parlour is led by jazz violinist and composer John Garner. 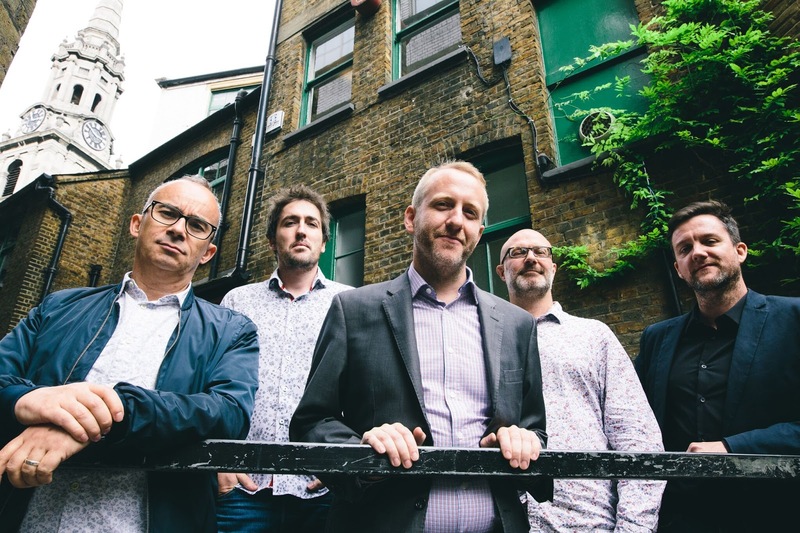 Formed in 2017 as a vessel for exploring new music, the ensemble features legends of the Northern scene Mark Williams on guitar, John Pope on double bass, and Russ Morgan on drums. Upbeat, groovy and thoughtful jazz. Winner of 'Jazz Ensemble of the Year' in the 2018 Parliamentary Jazz Awards comes to The Globe in a joint promotion by Jazz.Coop and Jazz North East. In ARQ, Alison Rayner has gathered a group of musicians who sympathetically support her music. To keep the Globe running as a community-owned music venue we rely on people coming to gigs and buying drinks. If you can't come to a gig you can still support us by making a donation.